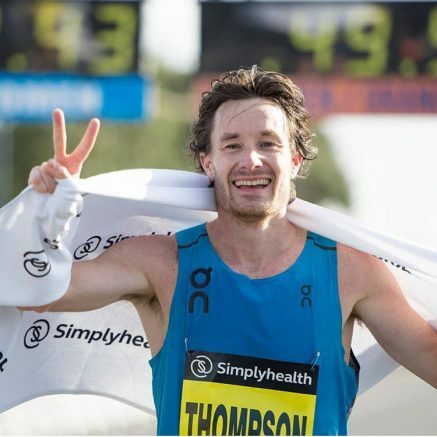 22nd October 2017 – Even storm Brian could not slow Chris Thompson (GBR) down as he banked another Great Run victory, this time at the Great South Run in Portsmouth. The wind that caused the previous days build-up races to be cancelled had eased but still made racing conditions tough and completely wrote off any chances of fast times. Therefore, it was a day for a good racing brain and in the final stages some grit and determination, all of which Chris possesses in abundance. From a large lead group early on, it was whittled down to three by 6 miles and only two by 8 miles. A bit of cat and mouse ensued with Chris and nearest challenger Ben Connor sizing each other up, but Chris had the greater strength and speed over the final mile to cross the line in 48:32 and retain the title which he won last year. Indeed, he was the first man since 1994 to defend the title.